Steven MacLean's stunning strike clinched a 2-0 victory for St Johnstone and condemned Partick Thistle to a third straight defeat to leave them bottom of the Ladbrokes Premiership. The visitors opened the scoring through Steven Anderson as the defender squeezed the ball in from a tight angle from Danny Swanson's delivery. However, MacLean put the match firmly beyond the Firhill men's grasp with a venomous 25-yard drive in the second half. Thistle had won all three games between the two sides last season but that record never looked likely to continue here as they were comfortably beaten. St Johnstone created the first real opportunity as MacLean's fearsome effort from Ricky Foster's cutback was well saved by Tomas Cerny. But there was nothing the Partick goalkeeper could do minutes later as Saints opened the scoring after 21 minutes through an unlikely source in defender Anderson. Good play down St Johnstone's right enabled Swanson to send in a deep, hanging ball to the back post, which caught out Cerny, and Anderson slid in to squeeze the ball home from an acute angle. The Thistle fans were frustrated with a string of misplaced passes from the home side as they looked to get back into the contest. Erksine almost provided the spark to ignite their fightback but he could not keep his curling effort down from the edge of the box. The hosts suffered a further blow after 39 minutes when Cerny had to go off injured after colliding with his own defender Danny Devine. Replacement Ryan Scully could only stand and watch as Chris Kane almost doubled Saints' lead on the stroke of half-time with an audacious acrobatic effort but it clipped the roof of the net. The hosts brought on Edwards for Ade Azeez at the interval and the midfielder missed a glorious opportunity to level the scores after 58 minutes, heading wide from Callum Booth's in-swinging delivery. That was to prove costly as Saints doubled their lead courtesy of a stunning 64th-minute effort from MacLean. Edwards gave away possession in the middle of the park and MacLean rifled in a shot into the top corner. 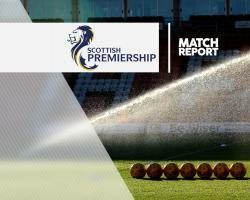 The Jags continued to plug away in search of a lifeline as Steven Lawless pulled his shot wide but his tame effort rather summed up Thistle's day.